With fellow NHL referee Daniel O’Rourke on the bag, Rank shot back-to-back 71s, finishing at two-under par at Ansley Golf Club’s Settindown Creek Course. Rank’s card featured two eagles in his first eight holes, guiding him to share medalist honors with Michael Hebert. Like many Canadian kids, Rank grew up playing hockey, reaching the Junior B level. Encouraged by his referee father Rich, he received his certification as an official as a teenager in order to earn spending money while he pursued his twin passions — hockey and golf. Garrett’s talent on the links became apparent early enough to earn him a scholarship to the University of Waterloo. He won back-to-back Ontario University Athletics individual golf titles in 2010 and 2011 and was named Waterloo’s athlete of the year in 2012. While he was at university, he continued refereeing. He also joined the varsity hockey team as a walk-on but stopped playing after spending several months recovering from testicular cancer in 2011. Within a few months, he was back to playing golf. In 2012, he made Golf Canada’s national team and was runner-up at the U.S. Mid-Amateur Championship — as well as refereeing 50 major junior games in the Ontario Hockey League and a handful of additional lower-level junior games. After three seasons as an OHL official, Rank was hired into the NHL’s minor league program. He worked his first NHL game at age 27 on January 15, 2015, and finished with three NHL assignments in the 2014-15 season. That grew to 31 games in 2015-16 before he was promoted to full-time status during the summer of 2016. As he climbed the officiating ranks, Rank also continued to impress with his golf game. He won the Canadian Mid-Amateur championship twice, represented Canada at the 2015 Pan American Games and played three RBC Canadian Opens. In 2016, he holed an eagle putt on 18 to open with a first-round 69, went on to make the cut and finished in a tie for 77th place. Golf and hockey have long gone hand in hand. Superstars like Mario Lemieux are known for their prowess on the links and former players Dan Quinn and Grant Fuhr both have profile pages on the PGA website. These days, Wayne Gretzky watches and advises his daughter’s partner and the father of her two children, Dustin Johnson. As well as possessing the physiological traits that make hockey players good golfers, Rank’s approach to officiating may also help him process high-stress moments on the links. We will soon find out as the 108th U.S. Open takes place from June 14-17 at the Shinnecock Hills Golf Club in Shinnecock Hills, New York as he will be in the field. He has truly gone from the Rink to the Links and beat cancer in the process. The annual visit to Augusta National Golf Club marks the start of the golf season, and The Masters is loaded with great stories as many of the game’s top players come into this week playing well. Where else could you start but with the greatest player of this era showing his best form in years? Woods’ back-to-back top-five finishes last month in Florida marked the first time since March of 2013 he’s had consecutive top-fives (that year he was both the Cadillac Championship and Arnold Palmer Invitational in consecutive starts). A look through the biggest names in golf shows a bunch of guys whose form is good. World No. 1 Dustin Johnson has a win in 2018. So does Rory McIlroy, a few weeks ago at the Arnold Palmer Invitational. So too, does Phil Mickelson. And Jason Day. And young Spanish phenom Jon Rahm. And we haven’t even talked about 2nd-ranked Justin Thomas, a two-time winner since his PGA Championship last August, or Bubba Watson, twice a Masters winner, who just captured the World Match Play Championship two weeks ago. With this many guys playing well heading in, the fireworks seem about to light up. Ian Poulter has played The Masters 12 times before, but never has his trip to Augusta been quite like this. At the match play two weeks ago, Poulter thought a top-16 finish had gotten him into the top 50 in the world rankings for a spot in the Masters, only to find out he actually wound up 51st. That meant his only chance was the last chance, to win at last week’s Shell Houston Open. Amazingly, the Englishman did, outlasting Beau Hossler in a playoff. He will seek to become the first player since Mickelson in 2006 to claim a Green Jacket after a win the week before. Jack Nicklaus’ historic run in 1986, when he came from nowhere to win the Masters at age 46, will forever live in golf lore. And 32 years later, Nicklaus still stands as being the oldest player to claim a Green Jacket. But Phil Mickelson has his sights set on changing that. Now 47 years old, Lefty still has the game, as evidenced by his win in March at the World Golf Championships-Mexico Championship. Mickelson’s record at Augusta is pretty amazing – in addition to three wins, he has 15 top-10 finishes and nine top-three finishes. The risk-reward of the course has fit his mentality and game over the years. The state of Australian golf seems to have slipped a tad, if you go just by rankings numbers. But make no mistake, a number of Aussies figure to be a factor this week. At No. 11, Jason Day is the highest-ranked Aussie, followed by Marc Leishman at 16 and Cameron Smith at 45. The lowest of this year’s Aussies, a little surprisingly, at No. 60, is 2013 Masters champ Adam Scott. Day and Leishman both have made runs here while Smith, the 2017 Australian PGA Champion, is off to a solid start this season in America. And you never count out a former champion like Scott. However, it’s been pretty rare for players to win the Green Jacket back-to-back, as Sergio Garcia will try to do after his breakthrough performance a year ago. It’s quite a list of players who have actually done it. Woods won in 2001 and 2002. Nick Faldo captured his first two of three wins in 1989 and 1990. Nicklaus captured two of six wins in 1965 and 1966. And that’s all. Garcia finally got into the major win column after almost 20 years with his playoff triumph against Justin Rose last year. Speaking of things tough to do at this tournament, history says you just don’t win in your first trip to play The Masters. In fact, if you throw out the first two years of the tournament, when pretty much everyone was playing for the first time, it’s only been won once by a rookie – Fuzzy Zoeller in 1979. The majority of this year’s field wasn’t even born when that happened. So while some may be tempted to pick a guy like long-hitting Tony Finau, or Rookie of the Year Xander Schauffele, or rising Chinese star Haotong Li this week, tread carefully. Even as the big names nipped at his heels, Ted Potter Jr. had ice water in his veins. And at the end of Sunday’s final round, Potter stood alongside the shore of the Pacific Ocean with a career-changing win, his second PGA Tour triumph, in the AT&T Pebble Beach Pro-Am. Potter ended up three shots clear of Phil Mickelson, Dustin Johnson, Jason Day and Chez Reavie for the win, his first since capturing the Greenbrier Classic back in 2012. Potter has won on tours all around the country on his way up to the big stage, ranging from the Moonlight Golf Tour to the NGA Hooters Tour to eventually the Web.com Tour, where two victories in 2011 got Potter to the big tour. He broke through that next year but then struggled a bit since both with play and injury, which included a broken ankle in July 2014 that kept him out for nearly two seasons. Sunday, Potter found his way to the top again, even as he had Johnson staring him down. Larry Fitzgerald has thrilled football crowds for many years catching passes in the Arizona desert. And clearly, he’s spent some time in the offseason on that state’s many golf course options. Fitzgerald and pro partner Kevin Streelman rolled to the Pro-Am division title at the event by seven strokes, bolstered by Streelman’s top-10 finish and multiple good shots by Fitzgerald, who plays off a 13 handicap but looked considerably better. The Genesis Open comes to a classic PGA Tour venue, Riviera Country Club, for this week’s stop. And the most familiar face in the game will be there, as Tiger Woods returns to his former hometown for the event. Woods has played twice in his latest comeback effort, including a tie for 27th in the Farmers Insurance Open a few weeks back. Two points from that – if Tiger Woods is going to be thrilled with a tie for 27th, it may be time to do something else. However, it’s also a nice step from a guy who hadn’t made a cut in a couple of years. We’ll see if he can make another solid step this week. Dustin Johnson’s 2018 has been strong, to say the least. He won by a whopping eight shots at the Tournament of Champions the first week of January, and his tie for 2nd at Pebble Beach has him firmly entrenched now at No. 1 in the world rankings. Johnson spent the week at Pebble partnered with his more famous father-in-law – hockey’s all-time leading scorer, Wayne Gretzky. AT&T Pro-AmDustin JohnsonLarry FitzgeraldPGA TourPhil MickelsonTed Potter Jr. Golf has crowned a new $10 million man, and a rising rookie took a big step toward becoming a household name, all in one afternoon as the 2016-17 season ended over the weekend at the Tour Championship. Justin Thomas didn’t win the final tournament, but he did climb to the No. 1 spot in the point standings, narrowly beating out his friend and former FedEx Cup champion Jordan Spieth for the $10 million prize for the season points champion. And Xander Schauffele had a great week of his own, making birdie at the final hole to claim a one-shot victory in the Tour Championship to claim his second win of the year and surely wrap up the PGA Tour’s Rookie of the Year race. Thomas nearly won both events, closing strong and narrowly missing a birdie putt at the final hole that would have given him a one-shot lead. The tap-in par was the sweetest of his career, as it guaranteed the points title before Schauffele even had finished. The rookie was just short of the 18th green in two shots, chipped up close and made a short birdie putt to win it. He captured the Greenbrier Classic this summer and was 26th in points entering the Tour Championship. With the win, he finished third, behind only Thomas and Spieth. For Thomas, it caps a simply unreal season. He won five tournaments, including his first major championship in August at the PGA Championship. His season sets up a great lookahead to next year, with Spieth, Thomas, a surging Hideki Matsuyama, Dustin Johnson and more all ready to do battle. This week brings the Presidents Cup, with competition taking place just outside of New York City at Liberty National. Honestly, it feels a bit anticlimactic so soon after the conclusion of the PGA Tour playoffs. And like the playoffs, it’s an event that struggles to get the national attention with not only the NFL and college football seasons rolling, but baseball’s final weekend of the regular season and the nearing of the NBA and NHL play. Still, a lot of great golf will be played. Team USA has dominated this event, but the likes of Matsuyama, Adam Scott and several others will give the international squad one of its best teams ever. Our final run of picks was a lot like most of the season. Close but no winner. Even as his countrymen Adam Scott and Jason Day were carrying the torch high for Australian golf, Marc Leishman was plugging along, putting together solid seasons and making his way. He took a big step forward in his career over the weekend, taking down the field at the BMW Championship, the third leg of the PGA Tour’s FedEx Cup playoffs. The win propels Leishman to the No. 4 spot in the point standings ahead of this week’s Tour Championship. He’s in serious position to strike and earn his biggest title. It’s not as if this is Leishman’s first trip to victory lane. He’s collected wins at the Travelers Championship and earlier this year at the Arnold Palmer Invitational and has more than $19 million in career earnings. And he was third a couple of weeks ago when Justin Thomas prevailed earlier in these playoffs. But now he has sights on his biggest achievement yet, a FedEx Cup championship, if he could repeat his success from last week. “I had my sights set high for the FedExCup and trying to get into the top five and … it’s nice to have the trophies there and be in that Top-5 and really if I have another good week next week, who knows what might happen,” Leishman said. Jordan Spieth heads into the Tour Championship still atop the points, boosting his position with a strong final-round 65 at the BMW that placed him ultimately tied for 7th. Justin Rose and Rickie Fowler tied for 2nd but well behind Leishman. Whose 23-under par total was five shots clear of the pairing. The defending points champion won’t be around to defend his title, as Rory McIlroy, who needed a high finish at the BMW, could only manage a tie for 58th and finished the week outside the top 30 to make the field. So who’s going to walk away with the title and the big payday? Matt Kuchar – Starting the week 12th, one of golf’s most consistent moneymakers tied for 5th at the BMW. Jon Rahm – And, he’s the guy Kuchar tied for 5th with. The young Spaniard is 5th in points in what’s really his first full season. Get used to this name. Jordan Spieth – He’s been so strong since winning The Open in July and he’s primed to make history and join Tiger Woods as the only two-time FedEx Cup winner. Longshot – Jason Dufner – There are no “longshots” in a 30-man field, but Dufner was the 30th and final guy to get in the tournament. Our two-week winning streak comes to an end. It’s do or die for PGA Tour players still alive in the race for the FedEx Cup. The 30 spots for the final event of the 2016-17 season will be determined from how players fare at this week’s BMW Championship. Essentially, this week makes for two races – the players fighting to get at least to that No. 30 spot, and those pushing to get to the top and go after the $10 million first prize for the season points race. In reality, most of those 30 spots already are set, based on points earned to this point. Perhaps the top 20 or so players are pretty much guaranteed spots in the final event regardless of what they do this week. But it isn’t impossible to make a big jump. Look no further than 2014, when Billy Horschel started the playoffs ranked No. 69 and needed a good showing in the BMW just to advance. It went a lot better than that. Horschel not only won the BMW but followed that with victory in the Tour Championship, spinning what had been a decent season into a life-changing one. That’s what getting hot in the playoffs is all about, regardless of the sport. Only one player – as you might guess, Tiger Woods – has won the FedEx Cup twice since its inception a decade ago. But the current points leader Jordan Spieth was the 2015 champion and playing as solid as he has since his playoff run that season. Just a reminder of our picks, which we published last week. We’re trying for our first three-week winning streak ever at Cleat Geeks. Dustin Johnson – The defending champion can really make the final week of the playoffs interesting with a repeat win. Hideki Matsuyama – When you’re trying for three straight wins, you have to take some chalk. Rory McIlroy – Surprisingly just 51st in the standings, McIlroy needs to make a big move if he wants another FedEx Cup. Justin Thomas continues to earn all the superlatives thrown his way. And at this rate, he may earn a title greater than “one of the best” golfers in the world. He clearly has his sights set for the very top of the mountain. Thomas outlasted his longtime buddy Jordan Spieth Monday to capture the Dell Technologies Championship, the second leg of the PGA Tour’s FedEx Cup Playoffs. A second straight runner-up finish propelled Spieth to the top spot in the points, with Thomas second. It’s the 5th win of the season for Thomas, who is pretty much on fire at this point. “It just was a great week because I felt like I didn’t have my best stuff at the start of the week and that’s just something I’ve gotten so much better at and I’m proud of myself more than anything,” Thomas said. Thomas charged into the lead early Sunday, playing the first seven holes in 4-under par, including an eagle 2 on the drivable par-4 4th. From there, he was able to hold off Spieth with a couple of back-nine birdies. Marc Leishman, who was tied for the lead with Thomas entering the final day, finished third, with Jon Rahm and Paul Casey another shot back tied for 4th. The playoffs take a week off before resuming at the BMW Championship Sept. 14-17. Seventy players are in this field, and the top 30 in points after the event move forward to the Tour Championship the following week. Last year, it was a familiar face claiming the title, as Dustin Johnson blistered the course in 23-under par for four days, finishing three shots ahead of Casey. Winning streak! That’s all we have to say about that. Longshot – Anirban Lahiri – The Indian squeaked in with the final spot in the top 70, so he has to go for broke this week to advance. Jordan Spieth gave an inch and Dustin Johnson took it. And golf fans got to be entertained by one of the best battles of the season, as the top two players in the Official World Golf Rankings stood toe-to-toe in the first event of the PGA Tour’s FedEx Cup playoffs. Ultimately, Johnson prevailed with a birdie on the first playoff hole, winning The Northern Trust and maintaining his hold of No. 1 in the world and pushing himself to the front of the line in the bid for a FedEx Cup that barely eluded him last season. Johnson heads into the second week of the playoffs with a 595-point lead over Spieth. PGA Champion Justin Thomas now stands in third. Spieth had jumped to a huge lead he was maintaining into Sunday’s final round. But a double bogey and bogey late in his front nine coupled with a 1-under par nine by Johnson saw what was as much as a five-shot lead evaporate. Then the two traded blows coming home before ultimately finishing in a tie at 13-under par, four shots better than anyone else. They came back to the 18th hole, where Johnson had just a dramatic up-and-down for par. This time, DJ was much more smooth, scoring birdie to claim his fourth win of the year and 16th career PGA Tour triumph. While unable to close the deal, it continues a superb summer for Spieth, who won The Open in July and is very much in the hunt to join Tiger Woods as the only two-time FedEx Cup champion. It’s survive and advance, with the top 70 in the standings after this week’s Dell Technologies Championship moving on to the third event of the playoffs. Last year, the tournament formerly known as the Deutsche Bank Championship saw Rory McIlroy leap to the head of the class with a one-shot win. McIlroy went on a few weeks later to claim the FedEx Cup after winning the Tour Championship as well. It only took about 10 months and 30-something tournaments, but we have finally picked a winner! Justin Thomas – If we’re going to get on a winning streak, taking guys who are always in the hunt (see above) is the easy choice. And the obvious one. Kevin Kisner – All he’s done is put up solid effort after solid effort. At 11th in points, he still has a chance to win the whole enchilada if he gets it going. 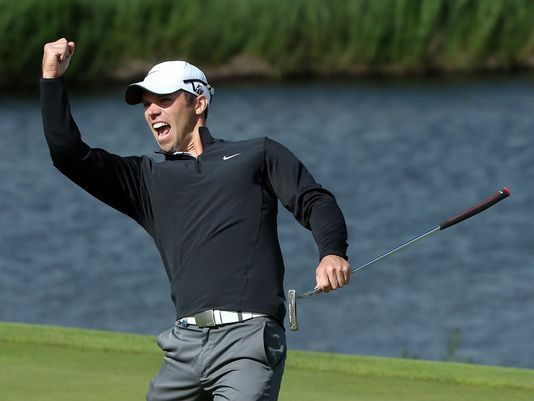 Paul Casey – Actually paired with Kisner the first two days, Casey is in kind of the same boat, needing a win to really vault into contention for the $10 million first prize. He was runner-up here last year. Longshot – Bud Cauley – Cauley needs a good week to keep his season going, entering 67th in the points. Since a superb summer a year ago that saw Henrik Stenson win The Open Championship and capture a silver medal at the Olympic Games, it’s been kind of a quiet run for the Swede. But the 2013 FedEx Cup champion has big-time momentum heading into this year’s FedEx Cup playoffs, capturing a one-shot victory over the weekend in the Wyndham Championship. Stenson jumped out with an opening-round 62 and just kept it going, scoring rounds of 66, 66 and 64 the rest of the way. He needed all of it, including birdies on holes 13, 15, 16 and 17 in Sunday’s final round. Ollie Schniederjans was right there all day Sunday and ultimately came home second, giving his playoff chances a big lift as he jumped from 74 to 39 in the standings. Second-round leader Webb Simpson finished third and jumped to 25th in the point list. Several players pushed into the top 125 to make the playoffs in the final week to do so. Rory Sabbatini had one of the best stories, contending on Sunday and eventually posting a tie for 4th to jump from 148 to 122 in the standings and barely sneak into the field this week. It’s playoff time, with The Northern Trust getting things started. The top 100 in the point standings after this week advance to next week’s event. A year ago, Patrick Reed kicked off the postseason in style with a one-shot triumph over Sean O’Hair and Emiliano Grillo. Reed ultimately came home third in the final FedEx Cup standings. While a few guys were up there, our winless campaign continues. Hopefully you just avoid guys we list at this point. Jason Dufner – A solid week heading into the playoffs. 12-under, tied for 14th. Scott Brown – A second-round 67 wasn’t enough to make the weekend. 2-under, missed the cut. Rickie Fowler – While that elusive first major championship has to wait another year, Fowler could make a huge career splash by winning the FedEx Cup. Starting fifth in the points, a win this week put him in the driver’s seat going forward. Dustin Johnson – It’s been a much quieter season than last year for DJ, but he has the game to play well anywhere. 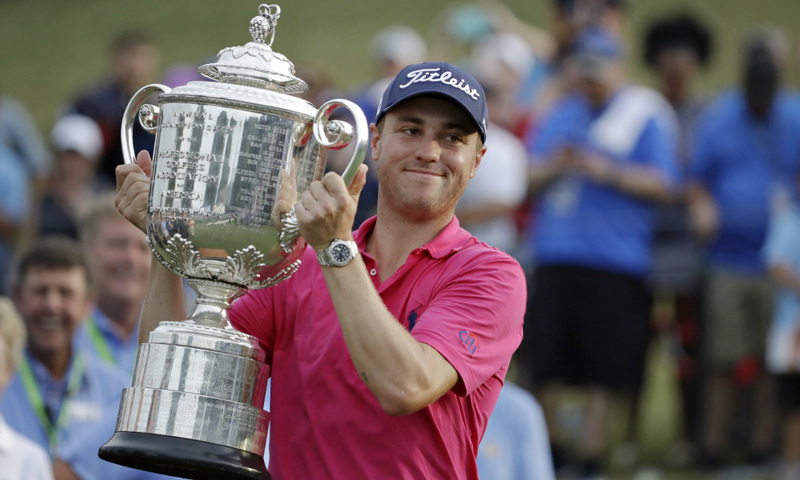 Justin Thomas – Sometimes the obvious pick is the one to make. Win No. 5 on the year would just about wrap up player of the year honors for JT. Longshot – Harold Varner III – Here’s a real longshot, as Varner just punched his ticket for the playoffs last week, jumping from 138th to 123rd with a top 10 finish. He’ll try to keep the momentum going. 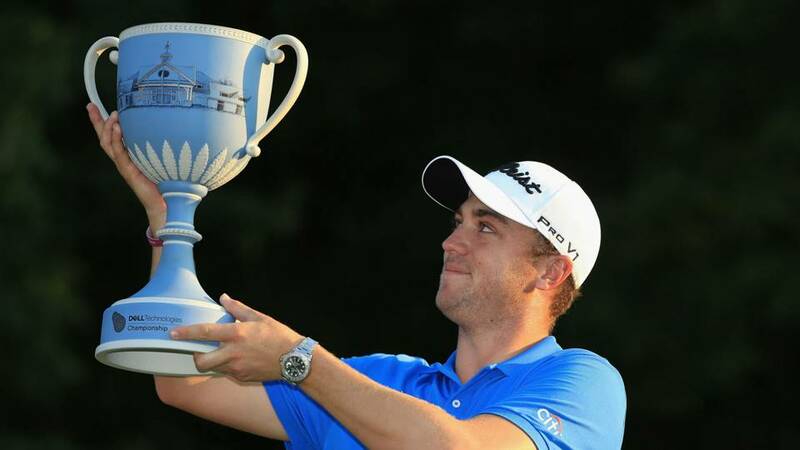 Charlotte is NASCAR country, but for a week it became the center of the golf world, hosting the PGA Championship. But the storyline went a lot like a race, with drama, passes and wrecks along the way as Quail Hollow Country Club wreaked havoc but also was the scene for many clutch shots. In the end, young star Justin Thomas made more of those big shots, including two huge back-nine birdies, avoiding the carnage at the top of the leaderboard and claiming his first major championship. The most dramatic moment came at the 13th hole, when Thomas chipped in from about 70 feet for an unlikely birdie, the first of two on the back nine’s par threes, helping him overcome a talented leaderboard featuring the likes of Hideki Matsuyama, Kevin Kisner and Patrick Reed. No doubt it looked pretty good to Thomas, as it did to his family and friends, both those at the course and beyond. The 24-year-old was particularly excited about being able to share the victory with his grandfather, one of his great influences in the game. Thomas got to speak to him shortly after the win. He just said, “You’re something else, and this is the first of many.” Thomas said. Kisner and Chris Stroud began the final round leading the way, with Matsuyama right in the hunt as well. Several others made a run on Sunday, including Reed and Rickie Fowler, who might have won the whole thing were it not for an awful finish in Saturday’s third round. But as others were struggling around him, Thomas was slicing through the difficult back nine like a boss. Three birdies propelled him to a great position and by the time he came to the tough 18th, Thomas had a three-stroke lead and was able to make a safe bogey and still maintain his edge. Reed, Francesco Molinari and Louis Oosthuizen ultimately tied for 2nd, while Fowler and Matsuyama were another shot back in a tie for 5th. Kisner, who had the lead a good bit of the week, tied for 7th with Canadian Graeme DeLaet while Stroud slid into a tie for 9th, a week after winning in Reno to qualify for the event. He celebrated afterward with fellow pros and longtime friends like Rickie Fowler, Bud Cauley and Jordan Spieth, who won The Open last month. What happened was another breakthrough for a young star. Now a four-time winner on the PGA Tour this season, Thomas is right in the hunt for player of the year honors and will be a major factor in the FedExCup playoffs. The Wyndham Championship is the final event before the playoffs. The top 125 on the money list after this event advance to the tour’s postseason, while the next 75 will have to fight to keep their cards via the Web.com Tour playoffs. The rest will be looking for other ways to continue their careers next season. Bill Haas – A former winner in this event and a former FedEx Cup champion, Haas has good memories of playing good golf this time of year. Ryan Moore – He’s battled some injury issues this year, but a solid top 15 finish at the PGA has Moore trending in a good direction. Jason Dufner – The former PGA champion was in the hunt in this event each of the last two years. His solid iron play is always a benefit. Longshot – Scott Brown – Brown tied for 13th at the PGA and has some urgency, as he needs a good week to boost his standing.